Kolkata has won the toss and has opted to bowl, Bhuvneshwar Kumar would be leading the Orange Army. 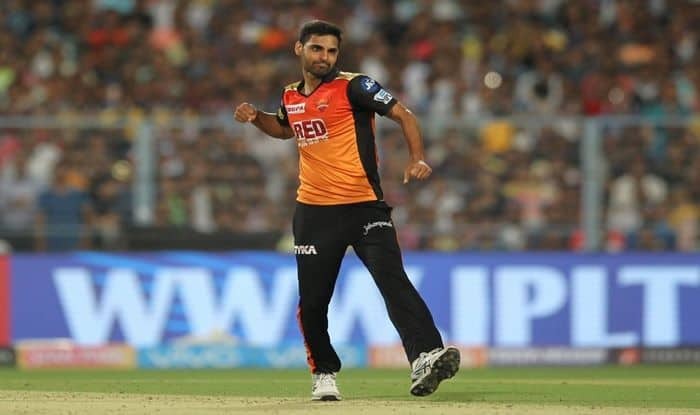 IPL 2019: Indian pacer Bhuvneshwar Kumar is set to lead Sunrisers Hyderabad against Kolkata Knight Riders at Eden Gardens in their tournament opener. Not used to the role of captaincy, Bhuvi is leading a side for the second time ever. The last time he ever led a team was his state Uttar Pradesh against Mumbai in Ranji Trophy. He also joined Ravichandran Ashwin to take most number of matches before leading a side in Indian T20 League. Ashwin made his captaincy debut after 111 matches in the league, whereas Bhuvneshwar Kumar has taken 103 matches to do so. Meanwhile, Kolkata has won the toss and opted to field first at the Eden Gardens.